The weight burden for today’s warfighter is higher than ever. Depending on the mission length, they may be carrying up to 40 kg (88 lb) of equipment along with the batteries that power them. 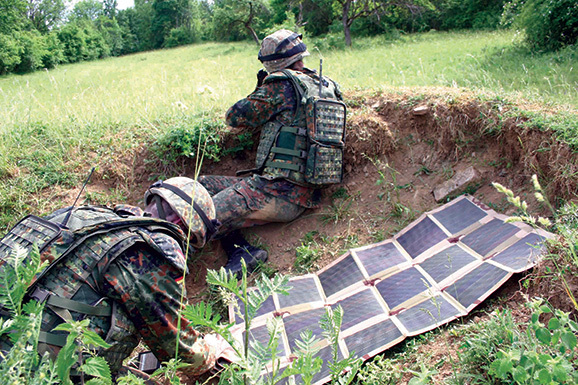 Different studies show that, depending on their role in the unit, a modern soldier will carry about 15 kg (33 lb) of rechargeable and non-rechargeable batteries for a 36-hour mission. Today, we see original equipment manufacturers (OEM’s) modifying their equipment to require less energy less energy and looking towards rechargeable batteries as a solution for the future. Bren-Tronics was the first company to design a military Li-Ion rechargeable battery for the US Army in 1995. Today there are more than 80,000 batteries manufactured each year. Soldiers still have to carry AA-batteries due to the variety of fielded military equipment powered by them. With their rechargeable batteries, they can recharge them in the field, thus lowering their weight burden by lowering the number of spare primary batteries they can leave behind. Bren-Tronics has developed a series of dedicated chargers that use multiple sources of energy such as rugged and flexible 60W solar panels, DC power from a vehicle cigarette-lighter socket, 24V vehicle power or can harvest/scavenge energy from other batteries to charge the standard military batteries such as BB-2590, ALI-142, ALI-143 and Sophie. Each charger has an integrated charge controller built-in so that the solar energy or any other source is properly treated and charges safely the dedicated rechargeable Lithium-ion battery. The total weight of such equipment is less than 2 kg (4 lb) and will charge 1 to 2 batteries within 3-5 hours. Charging is monitored by the charge-controller embedded and the cells are balanced at all times. In the event of an emergency evacuation, all equipment can be folded and stowed rapidly. It’s also important to note that a partially charged batteries is still of great use to the warfighter, so charging it even for a short time can mean the difference between calling in a strike or not. Bren-Tronics is proud to do our part to help reduce the soldier’s weight burden with innovative batteries and field proven chargers with the ability to draw power from universal sources of energy including our biggest free resource, solar energy.